With the introduction of smart phones and tablets, the technology world has experienced a drastic shift. With these additions comes the increase of application, which is seeing increased usage to enhance and connect all types of devices. Because of this, it is important to have the proper infrastructure and engineers that can manage all these new technologies. 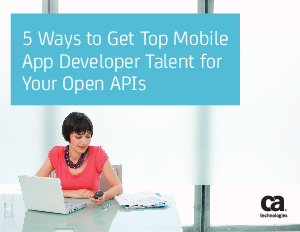 Download this whitepaper to learn 5 ways to get top mobile app developer talent for your open APIs and see why your organization will benefit from these additions.